Made from the soothing Aloe Vera leaf, Herbal Aloe Concentrate is now available in Cranberry twist flavour. 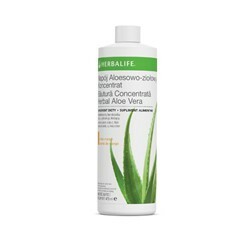 It’s a refreshing drink which contains Aloe Vera juice and no added sugar to give your water a refreshing taste. Mix 3 capfuls (1/2 fl. oz.) with 4 fl. oz. of water. To prepare 1 quart of drink, mix 1/2 cup concentrate with 1 quart of water. Add to your favorite beverage.